Road signs are supposed to clarify rather than complicate matters for motorists. 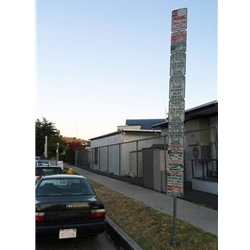 Unfortunately, some no parking sign postings come to take on a life of their own, such as the school parking signs posted outside a school in the Culver City neighborhood of Los Angeles, CA. The no parking sign post, which originally stood 15-feet tall, included eight distinct, restrictive parking signs with many of them having two or even three messages per sign. Some of the time limit parking signs seem to conflict with one another while others just made no sense at all no matter how you tried to decipher them. Starting from the top and reading down, the first no parking sign is the only one that makes any real sense and is easy to read and follow. “No Parking from 11 a.m.-1 p.m. Tuesday, for street cleaning,” it reads. At the very least, its meaning is clear as a standalone sign. Yet all of the remaining no parking signage is a muddle. The school parking sign second from the top – and particularly difficult to read – states “Tow-away school days. No stopping Mon. thru Fri. 7:30 a.m. to 4 p.m. School days exceptions. 15 minutes Mon thru Fri 7:30 a.m. thru 8 a.m. School business.” First the sign seems to warn against parking on school days or your vehicle could be towed. Then it says “school days are an exception.” How could they be the exception when they are first stated as being the rule? And that last line or two makes no sense no matter how you look at it. School days exceptions Mon., Tue., Thu., & Fri. 8 a.m. thru 8:30 a.m. CCUSD student valet service. 2:30-3 p.m. CCUSD permits. School days exceptions Mon., Tue., Thu., & Fri. 3 p.m. thru 4 p.m. CCUSD student valet service. There are then four more school parking signs similar to these on the post. Its like it never ended! Passerby’s started to question the validity of the signage; most could not believe that this was real.